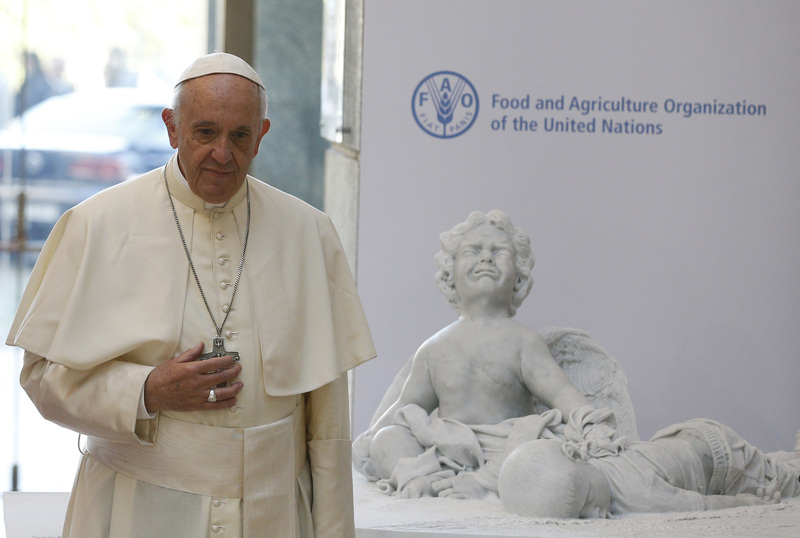 “It’s clear that wars and climate change cause hunger; let us stop presenting it as an incurable illness,” Pope Francis said in a powerful keynote address at the United Nations’ Food and Agriculture Organization on Oct.16. He called on governments worldwide to take collaborative action to overcome the three interconnected plagues of conflict, climate change and hunger. “In this situation, we can and we must change direction,” the pope said. “What is at stake is the credibility of the whole international system.” His audience included government ministers from the Group of Seven countries: Canada, France, Germany, Italy, Japan, the United Kingdom and the United States, as well as the ambassadors of F.A.O. member states and the organization’s top officials. Francis spelled out several concrete steps that need to be taken by governments and the international community at a moment in which hunger is on the rise for the first time in decades, with 815 million people suffering from chronic undernourishment and millions of migrants worldwide, as the F.A.O.’s director general, José Graziano da Silva, told the pope in his welcome address. This remark was widely interpreted as a reference to President Trump’s decision to withdraw from the Paris agreement on climate change, which was adopted on Dec. 12, 2015, and signed by 195 parties. It has already been ratified by 168 states. “It is necessary to strive for a concrete and practical consensus if one wishes to avoid the most tragic consequences that continue to fall on the poorest and most defenseless persons,” the pope said. He emphasized the need for a change in lifestyle, in the use of resources, in the systems of production and in consumption, especially regarding food, so much of which is lost or thrown away. He presented all the above as “the presuppositions” for any serious discussion about food security linked to the phenomenon of migration. Francis first spoke at the F.A.O. headquarters in 2014, and he was invited again this year to give the keynote address on World Food Day, which has as its theme: “Change the future of migration. Invest in food security and rural development.” Every year World Food Day is celebrated on the anniversary of the establishment of the F.A.O. by the United Nations on Oct. 16, 1945, to cope with the problems of hunger, the displacement of peoples and poverty in the wake of World War II. Likewise, he said, “to love the brothers and sisters, taking the initiative, without hoping for a return” is a principle that is found in all religions and cultures and has been converted into “the principle of humanity,” which is part of the language of international relations. All of this has been said before, to little effect. I would prefer that the Pope devote his time and energy to concentrate on the lack of priestly vocations, a problem that he is uniquely able to alleviate. Like his two predecessors, he seems unwilling to take on this horrific threat to the Church's survival. No elected politician could survive such a non-response to a coming disaster. The shortage of vocations to the traditional clerical sacerdotal Priesthood is due in no small measure to centuries (millennia?) of barely giving a footnote to the Priesthood conferred by Baptism. A system all too often characterized by Authoritarianism, Clericalism, Legalism and Disdain for the Laity is falling of its own weight. We must keep in mind that the protection against the gates of Hell prevailing is the pattern of the Paschal Mystery - death and resurrection. Our elected politicians seem to be surviving non-responses. That said, Pope Francis is advocating for the survival of our species. The earth will survive whether we are here or not. People however, are already dying as a result of climate change & will cease to exist if no action is taken. Assuming people are still living on this earth, the church will survive. The church has survived for 2000 years by changing. The church will eventually have to change in order to attract individuals for priestly vocations. Shades of Galileo Galilei! There we go again with the global warming thing. I wish the Vatican and other religious bodies would leave the science of global warming to the scientists, not to the theologians. What arrogance has taken possession of us poor frail creatures on this mortal coil, making us think that we can change the weather on this huge planet. We forget that glowing star out there that we fondly call the sun, which from time immemorial has been sending us its powerful rays, its warmth and its energy. We forget the powerful forces in the very belly of our magnificent planet, a planet we think we can tame. We’re acting like little gods. But we're just little ants. The Global Warming people often confuse global-warming /climate-change with ecology/environment. Taking care of the environment has nothing to do with trying to change the climate of Planet Earth. The Sun has been taking care of climate change for millions of years and will continue to do so. We little ants will take care of the environment/ecology side of the equation. One Galileo Galilei is more than enough! He never ceases to take pride in his willful ignorance. Idolatry of government, tyranny, and socialism cause hunger and poverty. For Francis to have enough humility to understand this would require that he abandon his idolatry.